And the amazing art of the pailloneé. 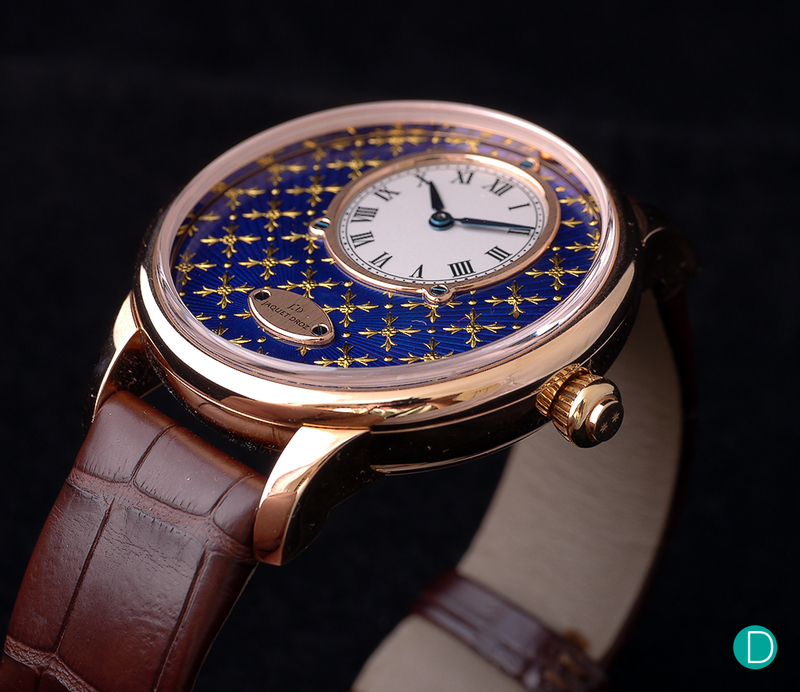 Jaquet Droz watches have a special place in the world of Métiers d’Art watches. This year, they extended the range further with the beautifully executed Petite Heure Minute Paillonnée. We spent a good week wearing the watch on our daily routine and putting it through its paces to bring you this hands-on review. The Jaquet Droz Petite Heuer Minute Paillonnée. Limited edition of only 8 pieces in red gold. Paillon is the French word used by artisans to mean “thin leaf of metal”. This is the art of making gold ornaments which were once thought to have been lost. Pierre Jaquet Droz was a virtuoso in this art in his day. And today, the house of Jaquet Droz revives the art as one of her main pillars. See our conversation with Christian Lattmann, President of Jaquet Droz where he discusses his priorities for the maison. The art of paillonnée enameling is rather unique among the decorative arts. The technique is delicate and consists of meticulously positioning tiny paillons of gold, one by one, to create perfectly geometrical patterns on coloured enamel. And then setting the design under a coat of transluscent enamel fondant. 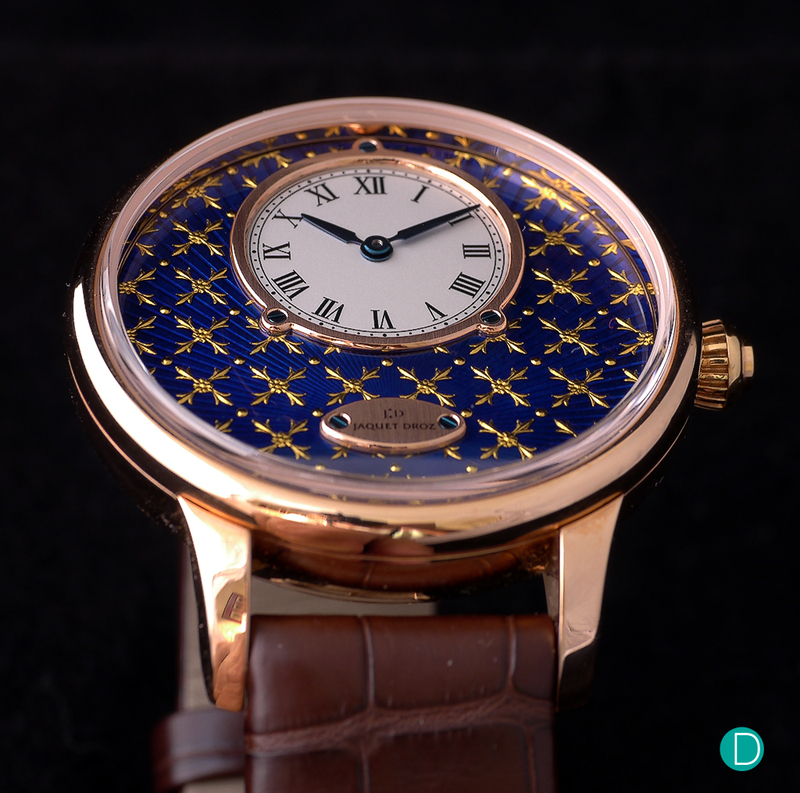 The base on which this art is practiced on is the grand feu enamel dial. Jaquet Droz makes these dials themselves. For a look behind the scenes and a glimpse of the secrets of the grand feu, read our article here. Note that although the method of making a grand feu dial is similar, Donzé Cadrans in the link is not related to Jaquet Droz. Donzé is a manufacture which is part of Ulysse Nardin, a member of the Kering Group. And Jaquet Droz is a brand owned by The Swatch Group. 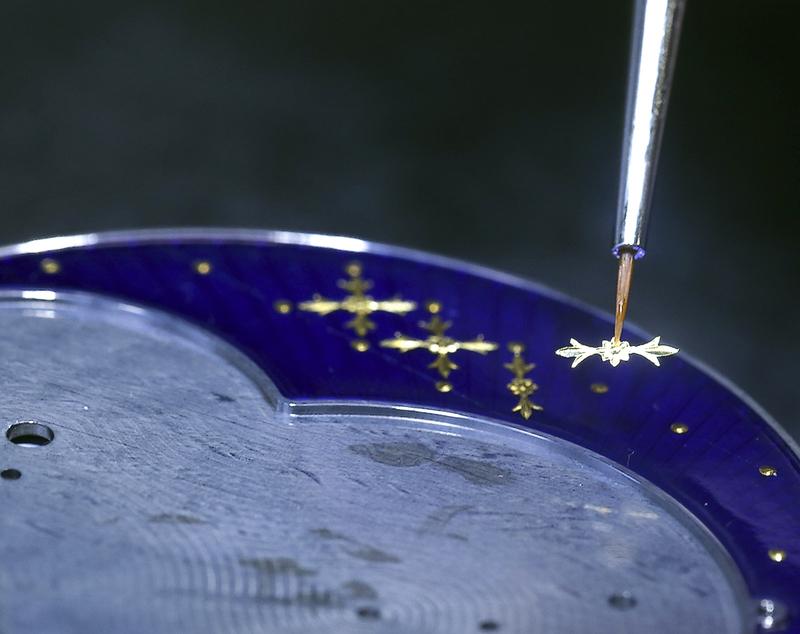 The paillons are applied by hand to the enamel dial, so each is a miniature 3 dimensional sculpture. Pierre Jaquet-Droz was a virtuoso of these techniques and thanks to him, among others, the art of paillonné enameling was at its zenith in the 18th century. When Jaquet Droz craftsmen resuscitated this process, they first used original paillons from that period. Now they have the expertise to produce their own paillons, adding a new emotional dimension to timepieces by blending the gestures of bygone days and modern times, then crowning this art with the unique coloring of grand feu enamel. The paillonnée technique has seen its application in Jaquet Droz watches for a few years, but this Baselworld 2017, we saw it in the Petite Heuer Minute range. As the name implies the Petite Heuer features a small hour and minute sub-dial on the top half of the dial. The negative space provided by such an arrangement allows the use for métiers d’art works to be showcased. This space is where the paillonnée is executed. The Jaquet Droz Petite Heuer Minute Paillonnée. The dial has all the magnificence of royalty. The case is a rather standard Jaquet Droz case, which in itself means that it is an elegantly designed case, and finished to a high level. The round case of the review sample in red gold is highly polished, and the soldered lugs makes for an elegant and sleek aesthetic. Jaquet Droz Petite Heuer Minute Paillonnée case is classical Jaquet Droz. Beautiful lines. The magic, and the raison d’être of the watch, so to speak is the dial. The base enamel is a mesmerising, blue with a beautiful play of colours as it catches light in different angles. The yellow gold paillons are hand applied, and are three dimensional structures featuring four leaves of the fleur de lys patten joined at the center to a floral motif. This is repeated in a lattice like framework throughout the dial. The sub-dial carrying the hour and minute indicators are inserts into the base enamel dial, and carried in a red gold ring held by blued steel screws. The ring is polished and has bevelled edges giving rise to a very refined look. The sub-dial itself is in silver opaline and carries Roman numeral hour markers and a minute railway track which are enamel and transfer printed. The hour and minute hands are lancet shaped, and in blued steel. The watch does not carry a seconds hand. At about 6 o’clock, below the sub-dial, a red gold nameplate with “Jaquet Droz” engraved is attached to the main dial via two blued steel screws. 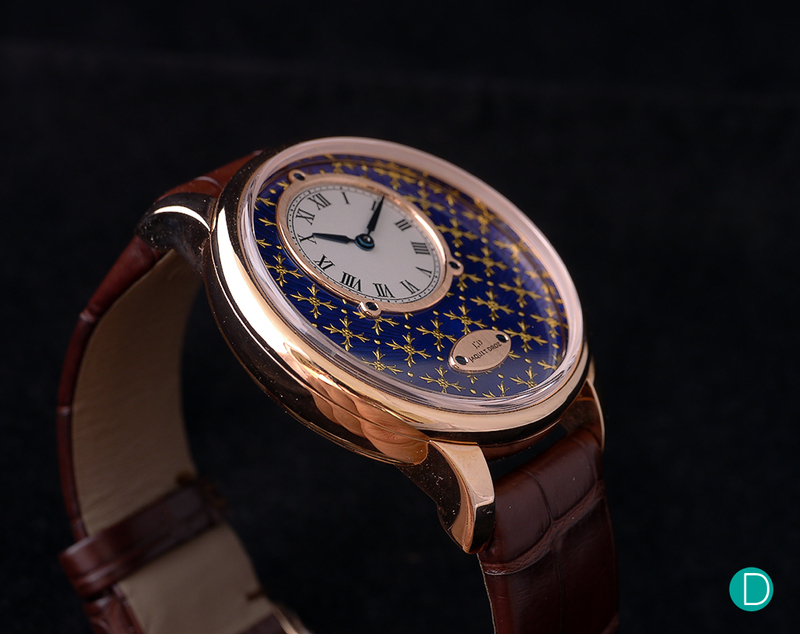 The dial for the time indication has reduced real estate to give pride of place and space to showcase the paillonnee artistry. 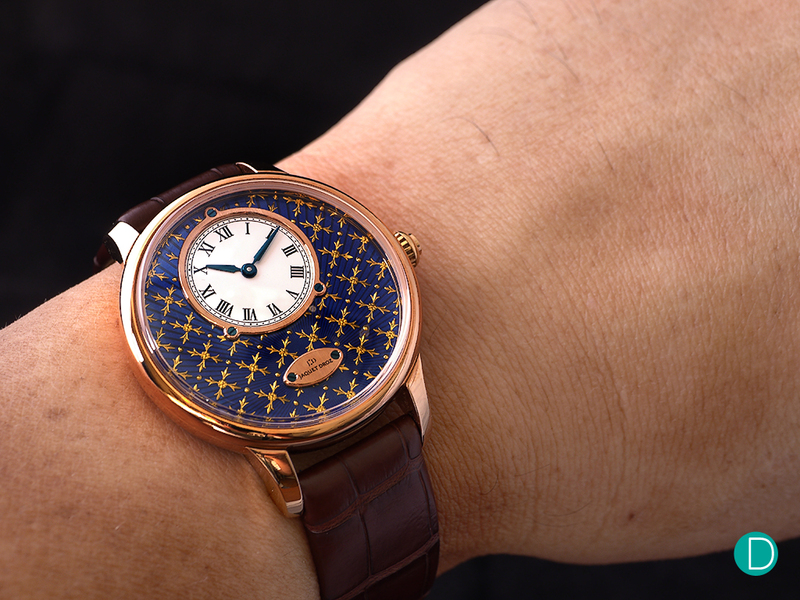 The enamel base dial has the blue enamel over a sunburst pattern radiating from the Jaquet Droz name plate, and the enamel remains translucent over the pattern which is discernable at certain angles. The translucent blue enamel has a deep and rich hue. The whole ensemble of the brilliant yellow gold paillons contrasting with the blue enamel is stunning. The dial has a nice contrast, and though the time indication is a sub-dial, it remains legible and clear. 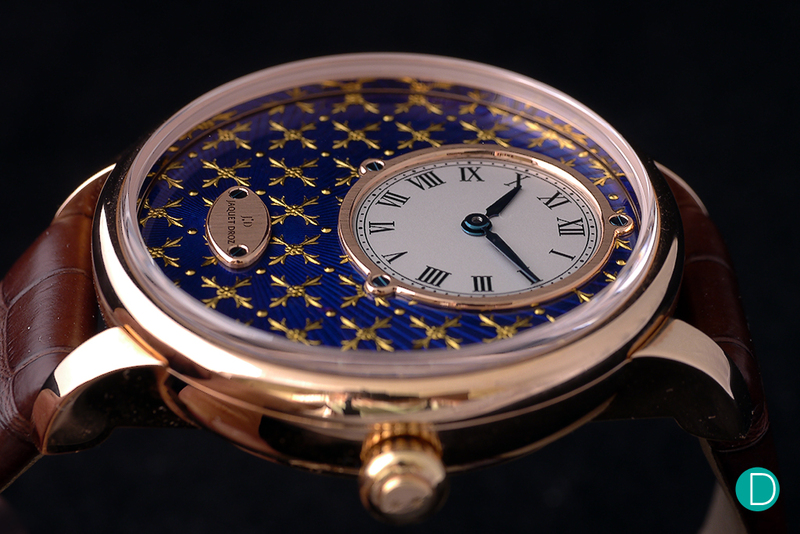 The paillonnée part of the dial takes pride of place, and is very beautiful. A red version with red enamel instead of the blue in our review sample is also available. The dial is where the Paillonnée magic happens. 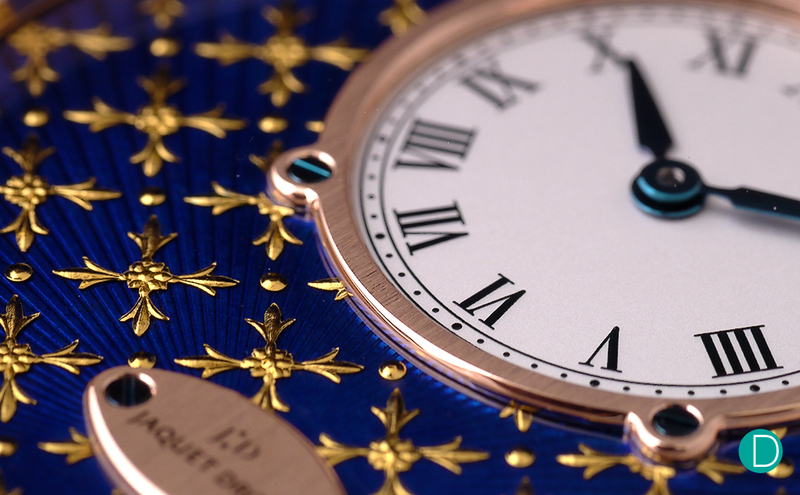 The paillons are tiny gold pieces applied to the grand feu enamel dial. Turning the watch over, reveals the sapphire case back showing the Jaquet Droz Caliber 2653. This is a movement supplied by Manufacture Blancpain (formerly F. Piguet). The movement is nicely decorated in accordance to the haute horologie aspirations of the Petite Heuer Minuite. The standard movement finishings at that level is executed well, with all elements addressed. The anglage, fausses côtes, polished counter sink for the screws and other openings on the dial are competently finished. 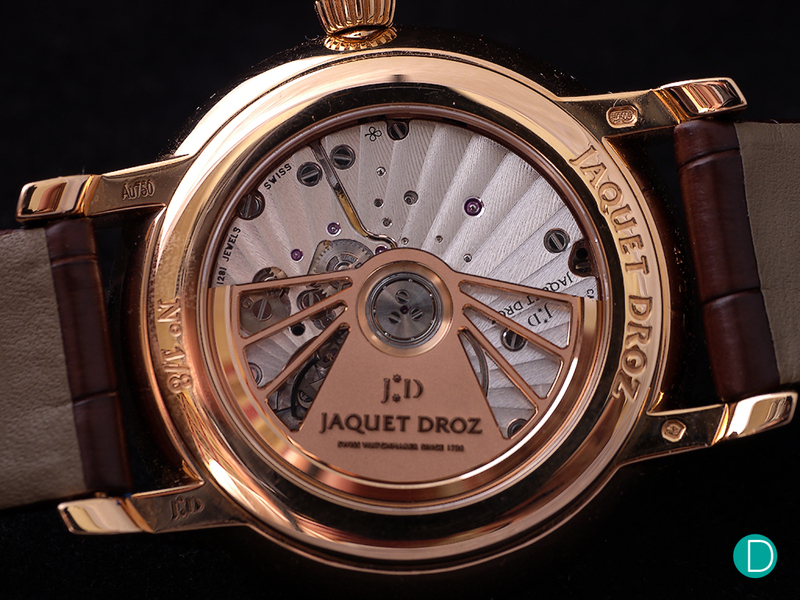 The red gold oscillating weight is finished in a nice matt finish and engraved with the Jaquet Droz name and logo. The C. 2653 beats at 28,800 bph and is equipped with 28 Jewels & has an approximate power reserve of 68 hours. Even for a watch which is used to showcase the artistry of the manufacture, the movement is no slouch. The movement is manufactured by sister company Blancpain exclusively for JD. We are not doing a Competitive Landscape for this watch as we do not know of another watch which features the paillonnée technique other than those from Jaquet Droz. In the Jaquet Droz collection, the watch is available as the Petite Heuer Minute with a blue enamel as well as a red enamel base, each limited to 8 numbered pieces. A pocket watch version of each dial colour is also available. The paillonnée technique is also available with a tourbillon as well as a version with the JD trademark Grande Seconde. The Jaquet Droz Les Ateliers d’Art Petite Heure Minute Paillonnée is priced at S$64,000 with GST. On the wrist the Jaquet Droz Paillonnée is a comfortable fit. The 39mm diameter case is almost perfectly sized. It dresses up and goes well with a bespoke suit and shirt, even as a discrete timepiece for black tie, though traditionally black tie dictates that no watch be worn. It also dress down beautifully with jeans and a polo or a sports jacket. Versatile. As a final thought, we leave you with this. Th watch is not your usual haute horologie watch. The movement is competently done, and indeed is very nice. But that is not the centerpiece. Neither is the complications it bears…as it has none. This is a two hand watch without even a seconds hand. The attraction of the Jaquet Droz Ateliers d’Art Petite Heure Minute Paillonnée is in the dial. Here the attention to detail is amazing. The depth of the enamel colour is magnificent. The beauty of the paillonnée technique, executed brilliantly is a joy to behold. The dial is a true work of art. And is the reason for the existence and reason to celebrate this watch. Well played Jaquet Droz. Dial: 18K Yellow Gold paillons in blue enamel dial with a silver opaline subdial with a 18k red gold ring and plate with blued steel screws.